All pets should be able to travel by car, if not for pleasure then in times of emergency such as visits to their veterinarian. Cats ands smaller pets must always be transported in a secure cage, pet carrier or box. The carrier should be well ventilated and be lined with a blanket or other suitable covering so that the pet can grip the floor of the container and feel comforted.Use a blanket, straw or other bedding that has his smell on. This will calm him and let him know that he is in a safe environment. When bringing your pets home do not leave them to slide around in the back of the car. Not only is it a strange environment but the possibly frightening experience may instil a fear of cars for the rest of their lives which will induce not only car sickness but in some pets aggression as well. It is likely that a pet will associate car journeys with the time it was taken away from its mother and the home he was born into. It's up to you to show your pet that the car is used to take them to nice places such as parks training classes. 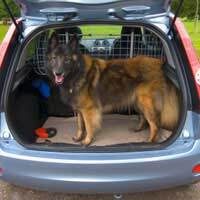 Dogs, possibly more than any other pets, will be expected to travel in the family car on a daily basis. Quite often this is because the place for their walks is not near their home. It may be that the dog always accompanies the owner as part of the family. Introduce the dog to the car; let him sit where he will be expected to travel even though the engine is not started. Gradually, if the puppy is nervous turn on the engine, but again do not move the vehicle. If the puppy is still wary then reward him for sitting in the vehicle and praise him well. Gradually take the dog out for short trips around the block and home again or perhaps to the shop. Never leave the pet alone in the car, as at this point he will become more stressed and possible damage the interior of the vehicle and injure him. If the pet is secured with a seat belt or in a cage he will learn to enjoy the journey. Dogs like to look out of the window and view their surroundings. All these activities will stop him from feeling and being sick. Never scold the animal for being sick, he cannot help it and the scolding will introduce another fear into your pet. Ensure the car has suitable coverings that can be taken away and washed easily if they are soiled. Get into the habit of always carrying wet wipes and paper towelling for cleaning purposes. A little water for the animal to drink is always welcome. If the pet is really distressed allow a passenger to sit with them and reassure the animal during the early trips. Before travelling do not feed the animal or let them drink too much water as this can exacerbate the sickness problem. Stop often and exercise the animal. When travelling with a pet you cannot expect to drive for hundreds of miles without a stop. Plan you route and arrange a short break no longer than every hour. If you always travel at speed, keeping in the outside lane of the motorway and overtaking everything in front of you your pet will become very stressed and most likely violently sick. Drive your car with the same care and consideration when carrying a pet as you would carrying a young baby. Never feed the pet sweets and treats during the journey and dissuade children from doing so. If you enjoy music while you travel remember that it may be upsetting to the animal. On motorway journeys the level of the car radio may be turned up to blot out road noise. In the back of the vehicle this volume is normally louder - remember it will be upsetting for the pet. Some dogs enjoy nothing more than to bark during a car journey, this can be very distracting for the driver and if not checked early on can become a life long habit. In some instances the barking dog can be thought as aggressive - or indeed his excitement could turn to aggression. A useful tip is to turn the car radio up to maximum for about five seconds and gradually reduce the noise. The dog should quieten as the volume is reduced. Ensure that a passenger controls the radio volume, as the driver must not be distracted from the road ahead. Do not give your pet drugs that are manufactured for humans with carsickness symptoms. Not only are the doses different but the ingredients could be harmful. Pet shops stock several brands of carsickness remedies designed for animals. If the symptoms get worse or cannot be cured with training then your vet will be able to prescribe a mild tranquilliser - but would you like to be transported while dopey and unable to move your limbs properly? Training at an early stage is kinder and safer for the pet. If your pet's journey is made as enjoyable as possible then the likelihood of carsickness is greatly reduced.